Exhibit research can be an opportunity to look more closely at some of the lesser-viewed pieces in our collections. Sometimes, this is an immediately fruitful process, with “aha” moments of connections to other materials and convenient stories just waiting to be discovered… more often, though, it’s less satisfying and more frustrating. When those new connections can’t be made, however, even the simple addition of some biographical facts from civic records can add context, provide new layers, and rediscover stories that might otherwise be forgotten. Take, for example, this reproduced photograph in our image collection. Though the people are identified, and the era can be guessed at, there are still questions. 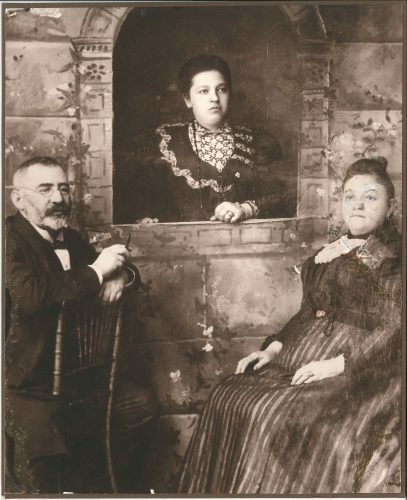 The photo shows an older couple seated in front of an elaborately painted studio backdrop, meant to resemble a castle; standing above them, in a ‘window’ cut out of the backdrop, is a younger woman. All three are well-dressed, befitting the occasion of having their likenesses preserved in a photographic portrait. The donors provided this description: “Mr. and Mrs. Morris (Moshe Pinchas Silverman) and their niece (subsequently adopted daughter), Dora (Devorah) Levy (earlier – first marriage – Buckstein).” This information gives us enough of the picture that finding new pieces – that is, making sure that we were finding the right pieces – was relatively simple, thanks to the Wonders of the Internet™. Census records, marriage license applications, City directories, and a few articles in the Baltimore Sun help to flesh out the Silbermans’ story. Once I’d confirmed that this was the same gentleman (thanks to this article in the Sun about whether Dora would inherit his life insurance), other pieces began to fall into place. 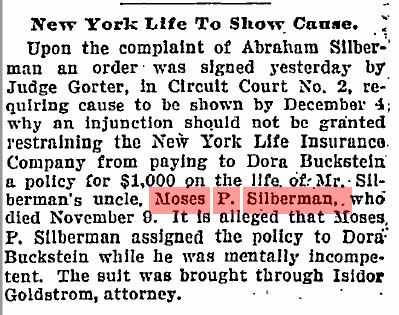 In the 1900 census, widowed Dora Buckstein is living at 908 E. Baltimore with Moses and Charne; in the 1910 census, she is alone at 908, listed as “manager, printing shop.” The City directory for that year shows that the shop was still listed under Mr. Silberman’s name, however. Looking back to the marriage records, we see that Dora married widower Max Levy on February 12, 1914; they were married by Rabbi Schwartz, of Shomrei Mishmeres. Max was the father of two children, Sol and Ida – the donors of this photo – who shared their stepmother’s photo and story with us in the mid-1970s. Dora died in 1963, and is buried at Mikro Kodesh, along with her aunt and uncle. We have no other photos of Dora, and I’ve found, so far, no photos of the print shop on E. Baltimore. (Today, that block is taken up by a building that now houses the new National Aquarium Animal Care and Rescue Center; the original storefronts are long gone.) 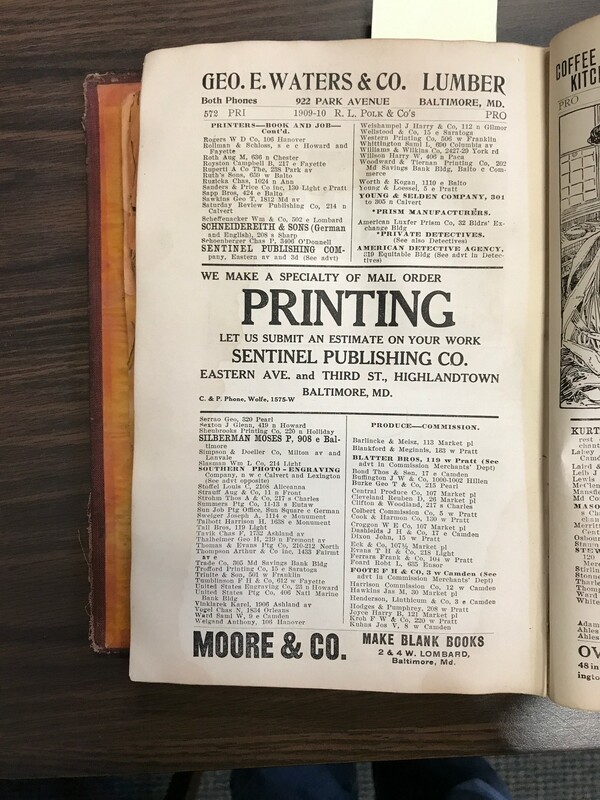 More digging is required to learn more about Dora’s life, and some elements – such as how she handled taking over her uncle’s printing business – may never be known. But even these few extra facts give the photo just a little more depth. ← Weekly Response: Podcast Sneak Peek!